As part of the Church of Ireland Historical Society’s commitment to supporting postgraduates and their research, we asked the 2018 W. G. Neely Postgraduate Prize Winner, Mathew Houston, to write a short blog about his essay. Here’s what he had to say. This paper stemmed from my PhD thesis which examined how leaders within the four largest Christian denominations in Northern Ireland responded to the challenges presented by the Second World War. That research encompassed the sermons of John Allen Fitzgerald Gregg, Archbishop of Armagh and Primate of All Ireland, which are held in the Armagh Robinson Library. Gregg, a revered figure within the Church of Ireland, effectively represented the views of much of his clergy. As such, this sermon material functioned as the foundation of my paper. By drawing on the content of Gregg’s wartime sermons, my paper discussed how the clergy of the Church of Ireland based in Northern Ireland viewed the war. To better elucidate the denomination’s interpretation of the conflict, it made occasional reference to the sermons and public addresses of other leading clergy. It sought to contextualise the Church of Ireland’s interpretation of World War II by comparing the rhetoric of its clergy to that employed by significant clerics of the Church of England. 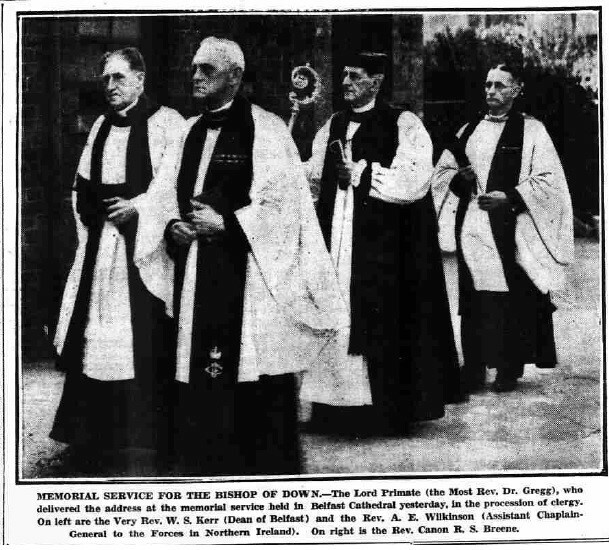 For the most part, the interpretation of the Second World War held by many Church of Ireland clergy was similar to, and influenced by, that of many leaders in the Church of England. During the 1920s and 1930s, Anglican church leaders on both sides of the Irish Sea were committed to preserving peace at almost any cost. Even in the face of Nazi Germany’s aggression, clerics remained committed to peace until around March 1939 when war seemed inevitable. Despite its apparent imminence, most churchmen only reluctantly accepted the necessity of conflict against Nazism. After the outbreak of war in September 1939 the majority of Protestant church leaders in Northern Ireland spoke out in support of the British war effort. Some clerics in Northern Ireland were more belligerent than their English counterparts because of their commitment to the unionist political agenda, although this was more common among Presbyterians than their Church of Ireland counterparts. Gregg and his colleagues adopted an increasingly bullish interpretation of the war after the fall of France in 1940. They deployed the language of crusade, describing Britain as a divinely appointed agent in a war to remove the threat which Nazism posed to Christianity. In preparing for peacetime, prominent clergymen in the Churches of Ireland and England regularly offered suggestions for the shape of the post-war world. These suggestions, though varied, shared a common theme. Christianity, and therefore the church, were the best guarantee of lasting international peace. The great crusade for Christianity, deemed a military success, could not be jeopardised through an unsatisfactory peace agreement. Matthew Houston is a graduate of Queen’s University, Belfast. His research interests broadly include the functions of public and private religiosity in the United Kingdom and Ireland during the 1930s and 1940s. He successfully defended his thesis in November 2018. Matthew’s PhD was entitled ‘The churches, Northern Ireland and the Second World War’ and his supervisor was Dr Andrew Holmes. He will collect the W.G. Neely Postgraduate Prize at the Society’s conference on 6 April 2019, which will be held at Armagh Robinson Library.